When I set out to teach any part of the Christian Scriptures, I feel like I have to understand how it is situated on multiple scales. But at the least, I have to study the 'book' scale, to understand how it is situated in the genre and work of art in which it lives and breaths. This is why I seldom accept preaching gigs on stand alone 'passages.' There is too much overhead. I try to do talks in clusters, to leverage the time spent exploring the 'work of art' scale for several of my own 'makings'. But I do something else peculiar. When presented with any large data set I usually try to translate it into visualizations. I try to make sense of the world by turning words or ideas into pictures or plots. In the past, I've just done this for my own understanding. This time, particularly because we were tackling the most vast and varied book of the Christian [2.5] Scriptures, I figured, if they were helpful to me, they might be helpful to others. So I crafted a talk around them. 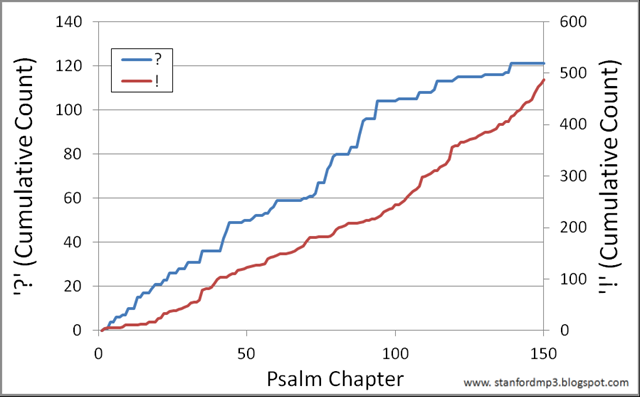 Without further preliminaries, here are some visualizations of the book of Psalms...with some quotes from the talk. "The answer to the question, what is the primary mood of these "authorized sample prayers" is "yes." There are as many ways of talking to God as there are ways to be human." "How long should you pray? Psalms answers, as long as it takes. Communication in all your best relationships happens on a distribution of temporal scales, logging the long talks makes the frequent, quick check-ins, possible. And the distribution isn't symmetrical. A simple Gaussian distribution doesn't capture it here. I'd go with something more like a Gamma distribution." 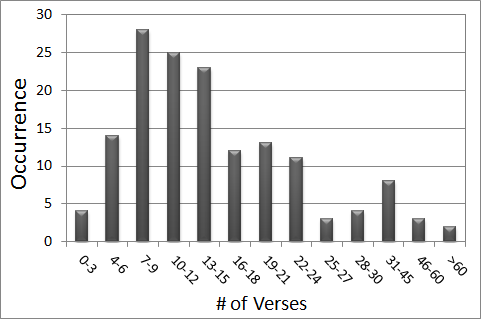 "The longest psalm has more verses than the shortest has characters (you could literally tweet 117)." "That is a rate of over 3 exclamation points per Psalm...and nearly a question per prayer. The idea that 'Christians aren't allowed to ask hard questions about God and reality' is empirically false, here are 120 little counter factuals to that claim." "There are also a lot of semi-colons, which makes sense, because an omniscient God may be alone in the universe in understanding precisely how to use those little monstrosities." "Many of these little prayers are 'worship set pieces' what we call liturgies, meant to be prayed again and again, by believers throughout the centuries and millennia, alone and together, but always in inter-generational community." 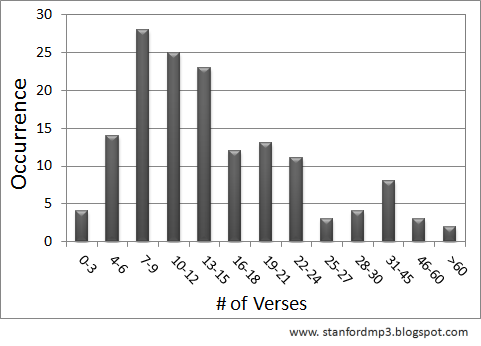 I set out to create a 'periodic table of Psalms.' I ran out of time. I still hope to do it. 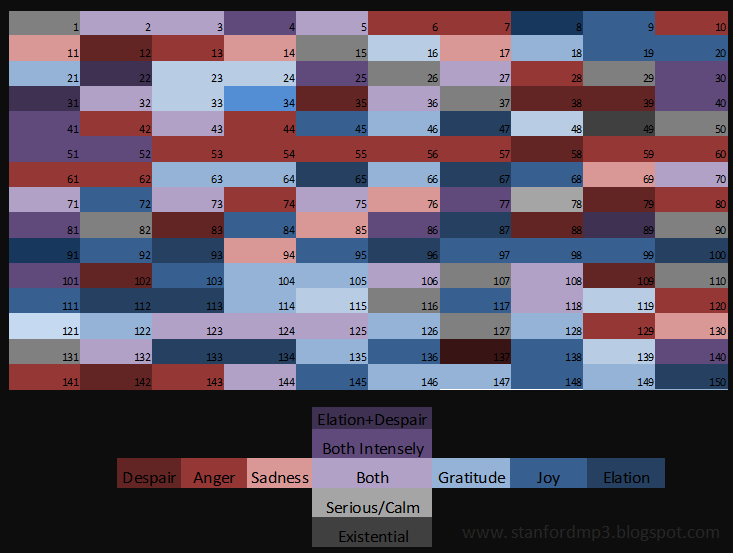 But for now, here is the raw data I collected, that can still be a guide to finding an authorized sample prayer that matches your state in mood and content, when you don't have the mental energy to make something up...and want to channel all your energy into volition instead of creation. I have argued before that preaching is more than collaborative art with the original authors (both created and creator) but it is not less. 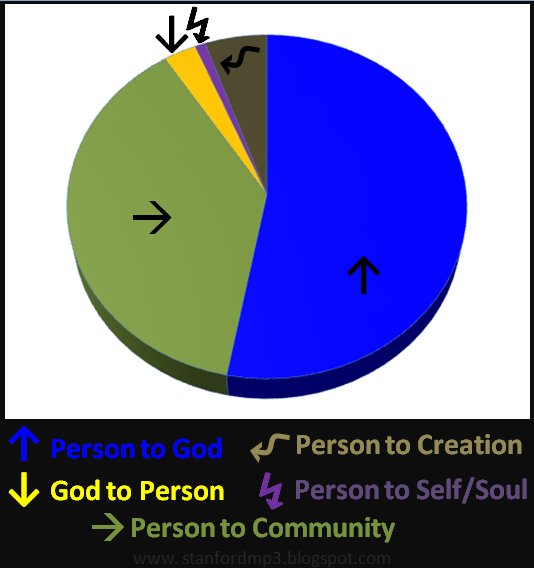 In a few weeks, I'll run the visualizations I created for the Gospel of John a couple years ago. [2.5] With no real narrative thread to hang my hat on. Gamma distributions get a skew with only 2 parameters, while you need 3 to get asymmetry out of a Gaussian distribution.